Suitable for testing for welded joints on railway tracks. Very portable and convenient use. Special Test Rig can check very quickly the defects in the Head region of the track. Most preferred by private contractors. Test Range 10 mm to 5 meter (in steel) adjustable in 1mm . Velocity 1000 m/s to 9999 m/s adjustable in 1 m/s . Frequency 0.5 MHz to 10 MHz . Calibration Set-up Special memory set-up allotted for Rail weld testing for easy set-up recall and testing. Total 50 calibration set-ups can be Stored and Recalled. Tandem Technique Special Test-Rig for tandem technique is provided for the Rail weld joint examination. Probe Complete set of probes are provided for the Rail weld examination. 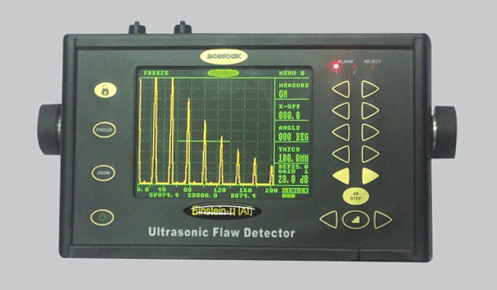 Software EinSoft Interface software for transferring A-Scan from Einstein-II(AT) to PC is supplied. Printer Attachment Any PC Printer with serial port can be attached for instant print-out of Trace Pattern(A-Scan with Set-up data). Display High brightness colour TFT LCD display. Display area 119×89 mm (320×240 pixel). Eleven different colour scheme options. Reference A-Scan Reference A-Scan pattern of standard test object can saved and recalled in the background for easy comparision during testing. Power Lithium-Ion Battery pack 14.4VDC,4AH, gives 8 hours continuous operation from fully charged battery. Full charging is done within 4½ hours. Size 154 x 255 x 68 mm (HxWxD).